The other night, Iain and I were watching something on television—I can't for the life of me remember what it even was now—and someone was telling a straight couple that they were the best couple zie knew, because he was like this and she was like that and together they made one awesome person. Iain and I turned and looked at each other with yikes-face. "That, ahh, doesn't feel like a compliment to me," I laughed. "I mean, I'm really glad you and I bring out the best in each other and all, but I am pretty invested in the idea of our being two completely separate people who are capable of being awesome all on our own." Iain and I are capable of, and enjoy, spending lots of time together. There was a time, when I was living in Scotland without a work permit while we waited on his visa approval, after he'd already quit his job because he'd expected to be living in the US by then, that we spent all our days together. This was hardly a challenge after living for so long on two different continents, but a few years later, we were working in the same office, spending all our days together, and it was hardly a challenge then, either. And after 13 years together, we still enjoy taking a staycation together, during which we typically spend all our days together. But we're also capable of, and enjoy, spending time apart. We both travel occasionally for work, sometimes for a few days, sometimes for a week. He's traveled back to Scotland on his own; I've traveled to see friends on my own. He has hobbies he pursues on his own, friends he sees that are his alone, and I have mine. We can be in the same room, each lost utterly in our own respective worlds, immersed in a video game or watching a movie or reading a book. We are separate people with individual identities. And, most importantly, with individual boundaries. The idea that a couple (or any number of partners in a romantic entanglement) complete each other, in some way forming one whole entity, is fundamentally incompatible with the recognition of individual boundaries. It subverts consent. It elides that one's own preferences might be different, and even contrary to, another person's preferences. I have heard, in response to my insistence that Iain complements me but does not complete me, that I'm being too literal, that it's just a romantic turn of phrase that doesn't really mean anything. Romantic conceits, like everything else that comes together to form a culture, do not exist in a vacuum. The romantic conceit of together forming one entity exists in a culture in which romantic relationships are one of the most common stages for abuses that begin with the subjugation of one person's identity, with the expectation that they are to subsume themselves fully into the other person's sphere. It exists in a culture in which even women in safe relationships with men may struggle to assert themselves fully, and in which women who make efforts to define themselves as more than an extension of male partners may face external pressure to show more deference. And those male partners may face criticisms for failing to properly exert control over "their" women. It exists in a culture in which we still debate the existence of "implicit consent" inside romantic relationships. That's a turn of phrase with a whole lot of baggage. I have no interest in making "one awesome person" with my partner. I can't even imagine what parts of me I'd have to consign to the abyss in order to merge with another human. And I don't want to spend my life with someone who looks to me to complete him. I got enough trouble trying to complete myself. 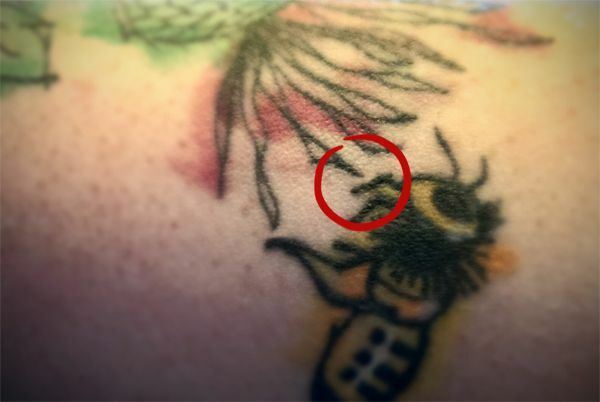 I've written before about my tattoo, which represents Iain and me with a thistle and a bee, in proximity but not touching. Our relationship lives in that space. That space is an entire universe—a universe in which I can look at Iain, and he can look at me, and say, "This is my boundary," and it is met with respect. Because there is no confusion about where one of us ends and the other begins. Words matter. The words we use inside of our relationships, and the words we use to describe our relationships, matter. The words Iain and I use, from the words we carefully chose and asked the judge to use at a courthouse the day we were married, have shaped our relationship. Into the shape of two people. When we were getting ready for bed, the evening we saw the above described exchange on some show I have already forgotten, Iain smiled at me in the mirror. "You don't complete me," I told him, smiling back. He laughed. "You don't complete me, either."